It’s a year ago today that I started this blog, and about one year ago that I signed up for Twitter. It’s been a learning process for me – surprisingly, even learning about myself! I feel that it’s time to assess how the social media have been working for me, and what directions I should take with them. First of all, the blog. Well, to be honest, I didn’t really know what I’d write about. I know lots of bloggers blog about writing, but – well, it just doesn’t interest me to write about writing itself. There is so much out there that I am interested in, so I decided to just go for it, write about whatever was catching my attention at that moment. Or, whatever I thought was important to write about, but that I would be unlikely to get published in other venues. What really surprised me was how much I ended up writing about food! About growing food, about gathering food, about sustainable and local food sources. The fact that I blogged about this so much really drove home to me how much our food supply, and where we source out food from, concerns me. Interestingly, these posts have proven to be some of my most-read blog posts as well. Until the ultramarathon-running tips posts were published (Multi-day race prep, Jan. 4, and Foot care while racing, Jan. 13), which were extensively linked-to by various sports-people and through Facebook, the most frequent route through which people found my blog was by googling the terms “Growing rice in Canada.” Who would have known? I wanted to find a carb source that I could grow out here on the west coast besides potatoes. I thought of rice – couldn’t find any info about growing it here in Canada on the internet – so just tried it out. Well, apparently I’m not the only one who’s been searching for info about rice-growing here in the north. Twitter has been a mixed blessing for me. I love it! Which is part of the problem. I do spend too much time on it, which of course cuts into my writing time. I still have not broken 100 followers – but my followers are great, all people who read something I wrote somewhere and decided personally that they want to hear more from me. So I feel that there really is a connection with them, far beyond the anonymity of the internet, and that is wonderful! I’ve had trouble working out who to follow, myself, though. I now follow just over 50 Twitterers, and there are many others that I’d like to follow – but the reality is that if I follow many more, I won’t actually have the time to read all the tweets that come in each day (at the moment in the low hundreds, and, so far, I still read nearly every one of them). So right now, the twitterers that I follow are mainly news organizations (e.g. @CBCNews, @cnnbrk) and various book-oriented publishers or writers (e.g. 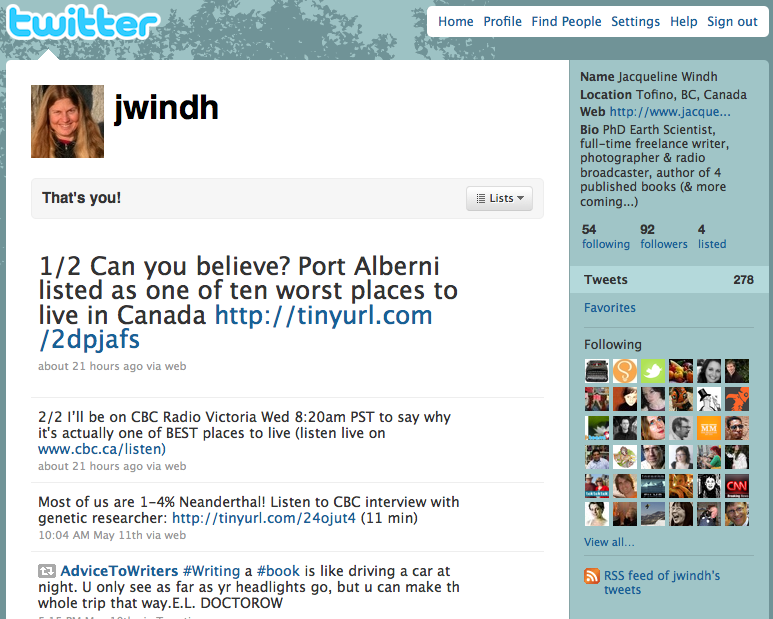 @globebooks, @GuardianBooks, and many others – check out my own “Following” list on http://twitter.com/jwindh). I also follow a few bloggers who work in writing or publishing, who do an absolutely stellar job of compiling articles that relate to the publishing industry: @inkyelbows, @thecreativepenn, @rachellegardner, and @nathanbransford. I highly recommend any writers to follow these guys – through the articles they’ve led me to, I’ve been able to keep up-to-date on the many twists and turns that the publishing industry has been through these last few months. So, where am I going to go with all of this? Well, I think the biggest thing that I’ve realized is that most of my blogging and tweeting is really about two different things – (1) myself and my interests as both a scientist and a writer, and (2) adventure sports. I think these two audiences are mostly mutually exclusive, so I realize that combining everything in one feed effectively dilutes anything I blog or tweet about. So I think what’s coming up in the next few months will be to split things up – get another Twitter account and set up a separate blog for the sporting themes. So this blog may actually move a bit towards writing about writing from time to time, after all (since writing is the main thing I do, these days) – but it will still be what it is now: a compendium of stuff that I find interesting, written when the inspiration strikes. And you may have noticed that I have not mentioned my use of Facebook. I’ve been reluctant to join Facebook right since it first came out because of the contract you must “Agree” to when you join. It has softened up somewhat since then (after Canada won a lawsuit against Facebook about privacy concerns) but it still requires that you assign Facebook all rights to anything you ever post there (which they will cede back to you when you delete your account provided that no one else has ever copied it anywhere… yeah, right). Every time I nearly succumb to the peer pressure (everyone is on it!) Facebook pulls some other move that draws me away again, e.g. this new scheme of tracking people through their so-called “Open Graph” system. ← Look at these great open-water swimmers – both Chilean record-holders. Looks like you are doing very well Ms. Windh.